Thanks to the incredible generosity of the Treasure Valley community, Friends of Zoo Boise is thrilled to announce that the $8.9 million goal for the Zoo with a New View Capital Campaign has been reached this week. At the beginning of March, Friends of Zoo Boise announced that they needed to raise at least $130,000 to complete the capital campaign or would risk losing a $1.5 million matching grant from an anonymous foundation. As proven many times before, the Treasure Valley community was very generous with many individual donors, the Gladys E. Langroise Advised Fund in the Idaho Community Foundation, and companies such as American Cleaning Service, Norco and Boise Cascade coming together to make sure the goal was reached. The Zoo with a New View Capital Campaign will fund the construction of a new 2.5 acre Gorongosa National Park Exhibit at Zoo Boise, expanding the zoo’s size by 1.5 acres. 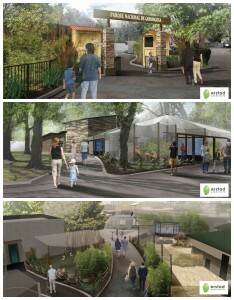 The Primate House and aviaries at the zoo will also be replaced by new visitor amenities and animal exhibits. This project will also provide ongoing support to Zoo Boise’s conservation partner, Gorongosa National Park in Mozambique. People can still support the project by purchasing a commemorative tile in the new exhibit. Tiles start at $250 and may be purchased online at www.zooboise.org/tile. Zoo Boise invites the community to Keep Your World Wild. The zoo turns the act of visiting the zoo into a conservation action. In the last nine years, visits to Zoo Boise have generated more than $2 million towards the conservation of animals in the wild, redefining why we have a zoo. Recently, Zoo Boise pledged $100,000 to help replant native vegetation on burned Table Rock. The zoo has also pledged $2 million over 10 years to support the restoration of Gorongosa National Park in Mozambique and is currently in raising funds to build a Gorongosa National Park Exhibit in Boise. Zoo Boise is owned by the City of Boise and managed by the Boise Parks and Recreation Department in partnership with the Friends of Zoo Boise, a private non-profit organization.